B.E.A.K. members seek additional student support. 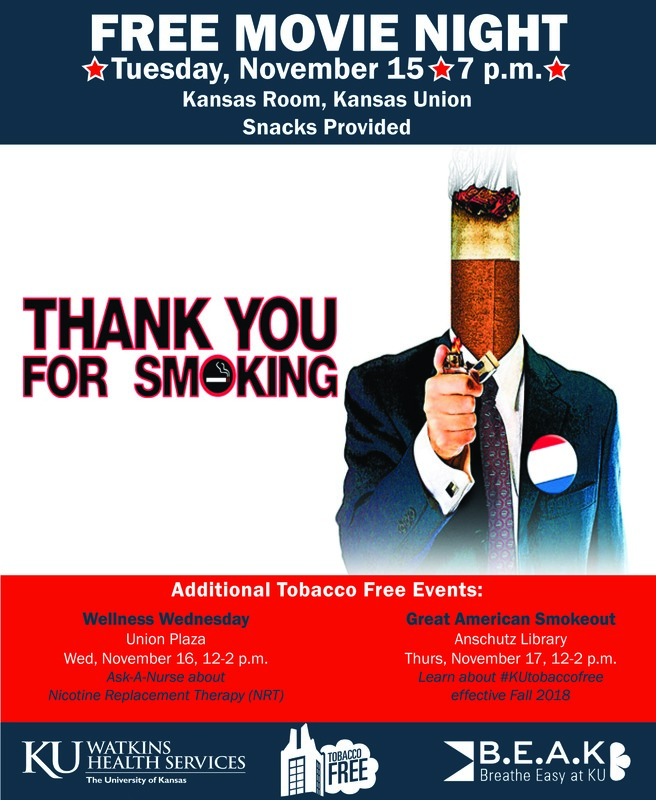 Tobacco-Free KU website went live. Consultant met with the Committees and various campus departments to discuss the initiative and process. Current smoking policy was revised by University Administration to prohibit use of electronic cigarettes. Grant funds were awarded from the Kansas Health Foundation to obtain consulting help for initiative and to fund campus activities. Secured consulting assistance of Ty Patterson, Executive Director of the National Center for Tobacco Policy. Campus organization B.E.A.K. (Breathe Easy at KU) was established to assist with the initiative through student support. Members of the Steering Committee attended the National Policy Summit in Kansas City, MO hosted by the National Center for Tobacco Policy. Steering Committee was established with support of the Office of the Provost to explore the feasibility of making the campus a tobacco-free environment. Steering Committee began to meet monthly to develop the initiative. Faculty/staff survey administered regarding stricter tobacco policy, smoke- or tobacco- free campus; results supported change. University Senate Executive Committee resolution: "SenEx encourages Student Senate in its initiative to develop a more restrictive smoking policy at the University of Kansas." University Senate resolution: "University Senate encourages Student Senate in its initiative to develop a more restrictive smoking policy at the University of Kansas." Student survey administered regarding stricter tobacco policy, smoke- or tobacco- free campus; results supported change.